GMT 4 programs contain all the high-level functionality. Prior to version 5, the bulk of GMT functionality was coded directly in the standard GMT C program modules (e.g., surface.c, psxy.c, grdimage.c, etc.). The GMT library only offered access to low-level functions from which those high-level GMT programs were built. The standard GMT programs have been very successful, with tens of thousands of users world-wide. However, the design of the main programs prevented developers from leveraging GMT functionality from within other programming environments since access to GMT tools could only be achieved via system calls . Consequently, all data i/o had to be done via temporary files. The design also prevented the GMT developers themselves from taking advantage of these modules directly. For instance, the tool pslegend needed to make extensive use of system calls to psxy and pstext in order to plot the lines, symbols and text that make up a map legend, making it a very awkward program to maintain. GMT 5 programs contain all the high-level functionality. Starting with GMT version 5, all standard GMT programs have been rewritten into separate function “modules” invoked by a single driver program called gmt.c. The gmt executable simply calls the corresponding GMT modules; it is these modules that do all the work. These new functions have been placed in a new GMT high-level API library and can be called from a variety of environments (C/C++, Fortran, Julia, Python, MATLAB, Visual Basic, R, etc.) . For example, the main program blockmean.c has been reconfigured as a high-level function GMT_blockmean(), which does the actual spatial averaging and can pass the result back to the calling program (or write it to file). The previous behavior of blockmean.c is achieved by calling gmt blockmean, i.e., the module is now just the first argument to the gmt executable. For backwards compatibility with older GMT (4) scripts we optionally install numerous symbolic links to the gmt executable with names such as blockmean, psxy, surface, etc. The gmt executable is smart enough to understand when it is being invoked via one of these links and then knows which module to call upon. Consequently, blockmean.c and other files do in fact no longer exist. GMT 5 API showing current and future external environments. In order for the API to be as flexible as possible we have generalized the notions of input and output. Data that already reside in an application’s memory may serve as input to a GMT module and we refer to such data as “Virtual Files”. Other sources of input may be file pointers and file descriptors (as well as the standard mechanism for passing file names). For standard data table i/o, the GMT API takes care of the task of assembling any combination of files, pointers, and memory locations into a single virtual data set from which the GMT module may read (a) all records at once into memory, or (b) read one record at a time. Likewise, GMT functions may write their output to a virtual destination, which might be a memory location in the user’s application (another Virtual File), a file pointer or descriptor, or an output file. The GMT modules are unaware of these details and simply read from a “source” and write to a “destination”. Thus, the standard concept of file-based input/output so familiar to any GMT user carries over to the API, except for the generalization that files can be virtual files already in memory. Because of this design we will see that we need to associate these virtual files with special filenames that we may pass to modules, and the modules will faithfully treat these as real files. However, under the hood the API layer will take care of the differences between real and virtual files. Users who wish to maintain their own data types and memory management can also use the GMT modules, but some limitations and requirements do apply: The user’s data can either be provided as (1) a 2-D matrix (of any data type, e.g., float, integer, etc.) and in any memory layout configuration (e.g., row-major or column-major layout) or as (2) a set of column vectors that each may be of any type. These custom arrays will need to be hooked onto the GMT containers GMT_MATRIX and GMT_VECTOR, respectively. Such objects can then be treated as virtual files for either input of output. Here, we document the new functions in the GMT API library for application developers who wish to call these functions from their own custom programs. At this point, only the new high-level GMT API is fully documented and intended for public use. The structure and documentation of the under-lying lower-level GMT library is not finalized. Developers using these functions may risk disruption to their programs due to changes we may make in the library in support of the GMT API. However, developers who wish to make supplemental packages to be distributed as part of GMT will (other than talk to us) probably want to access the entire low-level GMT library as well. It is unlikely that the low-level library will ever be fully documented. Building stand-alone custom executables that link with the shared GMT API. Our examples in this documentation are of this kind. There programs are likely to address a user’s special data formats or processing needs by leveraging high-level GMT modules to do some of the heavy lifting. Building shared library plugins to extend the breath of GMT. Users who wish to build one or more new modules and distributed then via a plugin that is dynamically loaded at run-time can now do so. At the present, all the modules in the official GMT supplement are compiled into a single plugin that can be accessed at run-time. Similarly, developers may add additional plugin libraries with any number of GMT-like modules and these will then be available from the gmt command (as well as from derived interfaces such as the GMT/MATLAB toolbox and the Python module). An example of plugin development is given by the GSFML extension to GMT. “Standard GMT program” refers to one of the traditional stand-alone command-line executables known to all GMT users, e.g., blockmean, psxy, grdimage, etc. Prior to version 5, these were the only GMT executables available. In GMT 5, these are accessed via the gmt executable. “GMT module” refers to the function in the GMT API library that is responsible for all the action taken by the corresponding standard GMT program. All such modules are given the same names as the corresponding programs e.g., “blockmean”, but are invoked via the GMT_Call_Module function. “GMT application” refers to a new application written by any developer. It uses the API, perhaps for custom i/o, and may call one or more GMT functions to create a new GMT-compatible executable. “GMT plugin library” refers to a collection of one or more new custom GMT-like modules that are presented as a plugin library. It such libraries are placed in the official GMT plugin directory or their path is added to the GMT defaults parameter GMT_CUSTOM_LIBS then the gmt executable can find them. “Family” refers to one of the many high-level GMT data types (e.g., grids, CPTs) and is typically a required argument to some API functions. “Method” refers to one of several ways in which data can be read or written in the API, including from existing memory variables. “Direction” is typically either GMT_IN (for reading) or GMT_OUT (for writing). In the API description that follows we will use the type int to mean a 4-byte integer. All integers used in the API are 4-byte integers with the exception of one function where an 8-byte integer is used. Since different operating systems have their own way of defining 8-byte integers we use C99’s int64_t for this purpose; it is guaranteed to yield the correct type that the GMT function expects. In version 5, the standard GMT programs are themselves simple invocations of the gmt application with the function name as argument. However, some of these modules, such as pslegend, gmtconvert, grdblend, grdfilter and others may call several additional modules. The GMT API knows how to create, duplicate, read and write six types of data objects common to GMT operations: Pure data tables (ASCII or binary), grids, images, color palette tables (also known as CPT), PostScript documents, and text tables (ASCII, usually a mix of data and free-form text). In addition, we provide two data objects to facilitate the passing of simple user arrays (one or more equal-length data columns of any data type, e.g., double, char) and 2-D or 3-D user matrices (of any data type and column/row organization ). We refer to these data types as GMT resources. There are many attributes for each of these resources and therefore we use a top-level structure for each object to keep them all within one container. These containers are given or returned by GMT API functions using opaque pointers (void *). Below we provide a brief overview of these containers, listing only the most critical members. For complete details, see Appendix A. We will later present how they are used when importing or exporting them to or from files, memory locations, or streams. The first six are the standard GMT objects, while the latter two are special data containers to facilitate the passing of user data in and out of GMT modules. These resources are defined in the include file gmt_resources.h; please consult this file to ensure correctness in case the documentation is not up-to-date. Note than in all instances the fundamental data variable is called “data”. Much data processed in GMT come in the form of ASCII, netCDF, or native binary data tables. These may have any number of header records (ASCII files only) and perhaps segment headers that separate groups of points or lines and polygons. GMT programs will read one or more such tables when importing data. However, to avoid memory duplication or data limitations some programs may prefer to read such records one at the time. The GMT API has functions that let you read your data record-by-record by presenting a virtual data set that combines all the data tables specified as input. This simplifies record processing considerably. Programs reading an entire data set will encounter several structures: A data set (struct GMT_DATASET) may contain any number of tables (struct GMT_DATATABLE), each with any number of segments (struct GMT_DATASEGMENT), each segment with any number of records, and each record with any number of (fixed) columns. Thus, the arguments to GMT API functions that handle such data sets expect a struct GMT_DATASET. All segments are expected to have the same number of columns. Data sets may have different geometries, such as representing a set of points, one or more lines, or closed polygons. GMT grids are used to represent equidistant and organized 2-D surfaces. These can be processed or plotted as contour maps, color images, or perspective surfaces. Because the native GMT grid is simply a 1-D float array with metadata kept in a separate struct GMT_GRID_HEADER header, we pass this information via a struct GMT_GRID, which is a container that holds both items. Thus, the arguments to GMT API functions that handle GMT grids expect this type of variable. The basic grid header holds the metadata written to grid files. GMT images are used to represent bit-mapped images typically obtained via the GDAL bridge. These can be reprojected internally, such as when used in grdimage. Since images and grids share the concept of a header, we use the same header structure for grids as for images; however, some additional metadata attributes are also needed. Finally, the image itself may be of any data type and have more than one band (channel). Both image and header information are passed via a struct GMT_IMAGE, which is a container that holds both items. Thus, the arguments to GMT API functions that handle GMT images expect this type of variable. Unlike the other objects, writing images has only partial support via grdimage . For the full definition, see GMT_IMAGE. The color palette table files, or just CPTs, contain colors and patterns used for plotting data such as surfaces (i.e., GMT grids) or symbols, lines and polygons (i.e., GMT tables). GMT programs will generally read in a color palette table, make it the current palette, do the plotting, and destroy the table when done. The information is accessed via a pointer to struct GMT_PALETTE. Thus, the arguments to GMT API functions that handle palettes expect this type of variable. It is not expected that users will wish to manipulate the CPT directly, but rather use this mechanism to hold them in memory and pass as arguments to GMT modules. Developers are unlikely to actually manipulate the contents of CPT structures but if needed then the full definition can be found in GMT_PALETTE. Normally, GMT modules producing PostScript will write to standard output or a designated file. Alternatively, you can tell the API to write to a memory buffer instead and then receive a structure with the final plot (or partial plot) represented as a long text string. The full structure definition can be found in GMT_POSTSCRIPT. Some data needed by GMT are simply free-form ASCII text tables. In many respects these are handled similarly to data tables. E.g., they may have any number of header records and even segment headers, and GMT programs can read one or more tables or get text records one at the time. A struct GMT_TEXTSET may contain any number of struct GMT_TEXTTABLE, each with any number of struct GMT_TEXTSEGMENT, and each segment with any number of text records. Thus, the arguments to GMT API functions that handle such data sets expect this type of variable. The user’s program may then parse and process such text records as required. This resources is particularly useful when your data consist of a mix or data coordinates and ordinary text since regular data tables will be parsed for floating-point columns only. For the full definition, see GMT_TEXTSET. Users may write programs that need to call GMT modules but may keep their data in separate 2-D arrays that the allocate and maintain independent of GMT. For instance, a program may have built an integer 2-D matrix in memory and wish to use that as the input grid to the grdfilter module, which normally expects a struct GMT_GRID with floating point data via an actual or virtual file. To handle this case we create a struct GMT_MATRIX container (see Create empty resources), assign the appropriate union pointer to your data matrix and provide information on dimensions and data type. We then open this container as a virtual file and pass its filename to any module. The full structure definition can be found in GMT_MATRIX. The enum types referenced in GMT_VECTOR and Table GMT_MATRIX and summarized in Table types. Likewise, programs may instead be manipulating a set of custom column vectors. For instance, the user’s program may have allocated and populated three column arrays of type float and wishes to use these as the input source to the surface module, which normally expects double precision triplets via a struct GMT_DATASET read from an actual or virtual file Simply create a new GMT_VECTOR container (see section Create empty resources) and assign the union array pointers (see univector) to your data columns and provide the required information on length, data types, and optionally range. Again, once we open this data as a virtual file we can pass its filename to any module expecting such data. The full structure definition can be found in GMT_VECTOR. Users who wish to create their own GMT application based on the API must make sure their program goes through the steps below. The details for each step will be revealed in the following chapter. We have kept the API simple: In addition to the GMT modules, there are only 57 public functions to become familiar with, but most applications will only use a very small subset of this selection. Functions either return an integer error code (when things go wrong; otherwise it is set to GMT_NOERROR (0)), or they return a void pointer to a GMT resource (or NULL if things go wrong). In either case, the API will report what the error is. The layout here assumes you wish to use virtual files as input sources (i.e., data you already have in memory); if the data must be read from actual data files then things simplify considerably. Initialize a new GMT session with GMT_Create_Session, which allocates a hidden GMT API control structure and returns an opaque pointer to it. This pointer is a required argument to all subsequent GMT API function calls within the session. Read a data set (or grid, etc.) into memory with GMT_Read_Data, which, depending on data type, returns one of the data structures discussed earlier. Associate your data with a virtual file using GMT_Open_VirtualFile. This steps returns a special filename that you can use to tell a module where to read its input. No actual file is created. Open a new virtual file to hold the output using GMT_Open_VirtualFile. This step also returns a special filename for the module to send its output. Prepare required arguments (including the two virtual file names) and call the GMT module you wish to use via GMT_Call_Module. Obtain the desired output object via GMT_Read_VirtualFile, which returns a data structure of requested type. Close the virtual files you have been using with GMT_Close_VirtualFile. We terminate the GMT session by calling GMT_Destroy_Session. This obviously assumes you have already installed GMT and that it is in your path. If you run example1 it will take a moment (this is mostly due to the gridding performed by greenspline) and then it stops. You should find the resulting grid junk.nc in the current directory. Plot it to see if it makes sense, e.g. If you intend to write applications that take any number of data files via the command line then there will be more book-keeping to deal with, and we will discuss those steps later. Likewise, if you need to process a file record-by-record then more lines of code will be required. The following is an alphabetical listing of all the public API functions in GMT. Click on any of them to see the full syntax of each function. The C/C++ API is deliberately kept small to make it easy to use. Summary of all the API functions and their purpose. Advanced programs may be calling more than one GMT session and thus run several sessions, perhaps concurrently as different threads on multi-core machines. We will now discuss these steps in more detail. Throughout, we will introduce upper-case GMT C enum constants in lieu of simple integer constants. These are considered part of the API and are available for developers via the gmt_resources.h include file. Most applications will need to initialize only a single GMT session. This is true of all the standard GMT programs since they only call one GMT module and then exit. Most user-developed GMT applications are likely to only initialize one session even though they may call many GMT modules. However, the GMT API supports any number of simultaneous sessions should the programmer wish to take advantage of it. This might be useful when you have access to several CPUs and want to spread the computing load . In the following discussion we will simplify our treatment to the use of a single session only. Bit 1 (1): If set, then GMT will not call the system exit function when a serious problem has been detected but instead will simply return control to the calling environment. For instance, this is required by the GMT/MATLAB toolbox since calling exit would also exit MATLAB itself. Unless your environment has this feature you should leave this bit alone. Bit 2 (2): If set, then it means we are calling the GMT API from an external API, such as MATLAB, Octave, or Python. Normal C/C++ programs should leave this bit alone. Its effect is to enable two additional modules for reading and writing GMT resources from these environments (those modules would not make any sense in a Unix command-line environment). Bit 3 (4): If set, then it means the external API uses a column-major format for matrices (e.g., MATLAB, Fortran). If not set we default to row-major format (C/C++, Python, etc.). Bit 4 (8): If set, the we enable GMT’s modern run-mode (where -O -K are not allowed and PostScript is written to hidden temp file). Default is the GMT classic run-mode. The print_func argument is a pointer to a function that is used to print messages from GMT via GMT_Message or GMT_Report from external environments that cannot use the standard printf function (this is the case for the GMT/MATLAB toolbox, for instance). For all other uses you should simply pass NULL for this argument. Should something go wrong during the API initialization then API will be returned as NULL. Finally, GMT_Create_Session will examine the environmental parameter TMPDIR (TEMP on Windows) to set the GMT temporary directory [/tmp on Unix, current directory on Windows]. While not super-exiting, this code demonstrates the two essential API calls required to initiate and later terminate a GMT session. In between we do what all basic programs are supposed to do: print “Hello, world”. The user is of course allowed to do whatever custom processing before the GMT session is created and can do all sorts of stuff after the GMT session is destroyed, as long as no GMT functions or resources are accessed. It may be convenient to isolate the GMT-specific processing from the custom part of the program and only maintain an active GMT session when needed. When using the standard GMT programs, it is common to specify input files on the command line or via special program options (e.g., -Iintensity.nc). The outputs of the programs are either written to standard output (which you may redirect to files or pipes into other programs) or to files specified by specific program options (e.g., -Goutput.nc). Alternatively, the GMT API allows you to specify input (and output) to be associated with open file handles or virtual files. We will examine this more closely below. Registering a resource is a required step before attempting to import or export data that do not come from files or standard input/output. GMT_ADD_FILES_IF_NONE (1) means “add command line (option) files if none have been registered already”. GMT_ADD_FILES_ALWAYS (2) means “always add any command line files”. GMT_ADD_STDIO_IF_NONE (4) means “add std* if no other input/output have been specified”. GMT_ADD_DEFAULT (6) means “always add any command line files first, and then add std* if no other input/output were specified”. GMT_ADD_STDIO_ALWAYS (8) means “always add std* even if resources have been registered”. GMT_ADD_EXISTING (16) means “only use already registered resources”. where family specifies what kind of resource is to be registered, method specifies how we to access this resource (see Table methods for recognized methods), geometry specifies the geometry of the data, ptr is the address of the pointer to the named resource. If direction is GMT_OUT and the method is not related to a file (filename, stream, or handle), then ptr must be NULL. Note there are some limitations on when you may pass a file pointer as the method. Many grid file formats cannot be read via a stream (e.g., netCDF files) so in those situations you cannot pass a file pointer [and GMT_Register_IO would have no way of knowing this]. For grid (and image) resources you may request to obtain a subset via the wesn array; otherwise, pass NULL (or an array with at least 4 items all set to 0) to obtain the entire grid (or image). The direction indicates input or output and is either GMT_IN or GMT_OUT. Finally, the function returns a unique resource ID, or GMT_NOTSET if there was an error. GMT constants used to specify a data family. GMT constants used to specify how data will be read or written. GMT constants used to specify the geometry of the data object. GMT constants used for domain array indexing. Actual integer dimensions of items needed (which depends on the family). Physical distances and increments of each dimension. An empty GMT_GRID structure with a header is allocated; the data array is NULL. Use registration to choose either gridline (GMT_GRID_PIXEL_REG) or pixel (GMT_GRID_NODE_REG) registration. The domain can be prescribed on one of two ways: (1) The par argument is NULL. Then wesn and inc can also be NULL but only if the common GMT options -R and -I have been set because they are required to get the necessary info. If they were not set, then wesn and inc must in fact be transmitted. If wesn and inc are set (directly or indirectly) then par is ignored, even if not NULL. (2) The par argument is not NULL but both wesn and inc are NULL. Now, par must have the number of columns and par must have the number of rows in the grid. Internally, inc will be set to 1/1 and wesn will be set to 0/n_columns/0/n_rows. As an option, add GMT_GRID_XY to mode and we also allocate the grids’s x and y coordinate vectors. Same procedure as for GMT_IS_GRID but we return an empty GMT_IMAGE object. In either way of specification you may use par to pass the number of image bands . We allocate an empty GMT_DATASET structure consisting of par tables, each with par segments, each with par rows, all with par columns. The wesn, inc, and registration argument are ignored. The data argument should be NULL. We allocate an empty GMT_TEXTSET structure consisting of par tables, each with par segments, all with par text records (rows). The wesn, inc, and registration arguments are ignored and should be NULL/0. The data argument should be NULL. We allocate an empty GMT_PALETTE structure with par palette entries. The wesn, inc, and registration arguments are ignored and should be NULL/0. The data argument should be NULL. We allocate an empty GMT_POSTSCRIPT structure with a text buffer of length par. Give par = 0 if the PostScript string is allocated or obtained by other means. The wesn, inc, and registration arguments are ignored and should be NULL/0. The data argument should be NULL. We allocate an empty GMT_VECTOR structure with par column entries. The number of rows can be specified in one of two ways: (1) Set the number of rows via par. Then, wesn, inc, and registration arguments are ignored. (2) Specify wesn, inc, and registration and the number of rows will be computed form these parameters instead. The data argument should be NULL. If you have custom vectors you wish to use then pass par = 0 to avoid any allocation and use GMT_Put_Vector to hook up your vectors. We allocate an empty GMT_MATRIX structure. The domain can be prescribed on one of two ways: (1) Here, par is the number of columns while par has the number of rows. Also, par indicates the number of layers for a 3-D matrix, or pass 0, 1, or NULL for a 2-D matrix. (2) Pass wesn, inc, registration and we compute the dimensions of the matrix. The data argument should be NULL. As for vectors, give dimensions as 0 and hook your custom matrix in via a call to GMT_Put_Matrix. For grids and images you may pass pad to set the padding, or -1 to accept the prevailing GMT default. The mode determines what is actually allocated when you have chosen grids or images. As for GMT_Read_Data you can pass GMT_CONTAINER_AND_DATA to initialize the header and allocate space for the array; here data must be NULL. Alternatively, you can pass GMT_CONTAINER_ONLY to just initialize the grid or image header, and later call GMT_Create_Data a second time, now passing GMT_DATA_ONLY, to allocate space for the array. In that second call you pass the pointer returned by the first call as data and specify the family; all other arguments should be NULL or 0. Normally, resources created by this function are considered to be input (i.e., have a direction that is GMT_IN). The exception to this is for containers to hold results from GMT which need have a direction set to GMT_OUT. Such empty containers are requested by passing mode = GMT_IS_OUTPUT and setting all dimension arguments to 0 or NULL. The function returns a pointer to the data container. In case of an error we return a NULL pointer and pass an error code via API->error. where col is the vector number you wish to obtain a pointer to. If you do not know the number of rows in the segments or you expect different segments to have different lengths then you should set the row dimension to zero in GMT_Create_Data and add the segments manually with GMT_Alloc_Segment, which allocates a new GMT_DATASET or GMT_TEXTSET segment for such multi-segment tables. where header is the segment’s desired header (or NULL) and family selects which kind of resource is desired , which in this case should either be GMT_IS_DATASET or GMT_IS_TEXTSET. If S is not NULL then we simply reallocate the lengths of the segment; otherwise a new segment is first allocated. For a GMT_DATASET there is also the option of controlling the allocation of the segment array by setting n_rows = 0. This would allow external arrays (double-precision only) to connect to the S->data[col] arrays and not be freed by GMT’s garbage collector. which returns a pointer to the allocated resource. Specify which family and select mode from GMT_DUPLICATE_DATA, GMT_DUPLICATE_ALLOC, and GMT_DUPLICATE_NONE, as discussed above (also see mode discussion above). For GMT_GRID you may add GMT_DUPLICATE_RESET which will ensure the duplicate grid will have normal padding (useful when the original has non-standard padding). For GMT_DATASET and GMT_TEXTSET you can add modifiers GMT_ALLOC_VERTICAL or GMT_ALLOC_HORIZONTAL to the mode if you wish to put all the data into a single long table or to paste all tables side-by-side, respectively (thus getting one wide table instead). Additional note for GMT_DATASET: Normally we allocate the output given the corresponding input dimensions. You can override these by specifying your alternative dimensions in the input dataset’s variable dim. The data is a pointer to the resource you wish to duplicate. In case of an error we return a NULL pointer and pass an error code via API->error. which returns a pointer to the converted resource. Specify the needed family for both the input and output resources and set the (up to) three flags passed via the flag array. The first flag determines how table headers and segment headers should be handled. By default (flag = 0) they are preserved (to the extent possible). E.g., converting a GMT_DATASET to MATRIX always means table headers are skipped whereas segment headers are converted to NaN-records. Other values for this flag is 1 (Table headers are not copied, segment headers are preserved), 2 (Headers are preserved, segment headers are reset to blank), or 3 (All headers headers are eliminated). Note that this flag only affects duplication of headers. If the new object is written to file at a later stage then it is up to the GMT default setting if headers are written to file or not. The second flag controls how many columns to expect when converting GMT_TEXTSET only. If 0 then we try to determine the number of columns from the first text record. If family_in is not GMT_IS_TEXTSET then flag is ignored. The third flag controls restructuring of tables and segments within a set. For flag = 0 we retain the original layout. Other selections are GMT_WRITE_TABLE_SEGMENT (combine all segments into a single segment in a single table), GMT_WRITE_TABLE (collect all segments into a single table), and GMT_WRITE_SEGMENT (combine segments into one segment per table). Many family combinations are simply not allowed, such as grid to color palette, dataset to image, etc. If your program needs to import any of the six recognized data types (data table, grid, image, CPT, PostScript, or text table) you will use the GMT_Read_Data or GMT_Read_VirtualFile functions. The former is typically used when reading from files, streams (e.g., stdin), or an open file handle, while the latter is only used to read from memory. Because of the similarities of these six import functions we use an generic form that covers all of them. All input functions takes a parameter called mode. The mode parameter generally has different meanings for the different data types and will be discussed below. However, one bit setting is common to all types: By default, you are only allowed to read a data source once; the source is then flagged as having been read and subsequent attempts to read from the same source will result in a warning and no reading takes place. In the unlikely event you need to re-read a source you can override this default behavior by adding GMT_IO_RESET to your mode parameter. Note that this override does not apply to sources that are streams or file handles, as it may not be possible to re-read their contents. If you have a single source (filename, stream pointer, etc.) you can call GMT_Read_Data directly; there is no need to first register the source with GMT_Register_IO or gather the sources with GMT_Init_IO. Furthermore, for GMT_DATASET and GMT_TEXTSET you can also specify a filename that contains UNIX wildcards (e.g., “all_*_[ab]?.txt”) and these will all be read to produce a single multi-table GMT_DATASET or GMT_TEXTSET (for other datatypes, see GMT_Read_Group instead). If you want to specify stdin as source then pass input as NULL. If you already registered all desired sources with GMT_Init_IO then you indicate this choice by passing the invalid geometry = 0. Space will be allocated to hold the results, as needed, and a pointer to the object is returned. If there are errors we simply return NULL and report the error. The mode parameter has different meanings for different data types. mode contains bit-flags that control how the CPT’s back-, fore-, and NaN-colors should be initialized. Select 0 to use the CPT resource’s back-, fore-, and NaN-colors, 2 to replace these with the current GMT default values, or 4 to replace them with the color table’s entries for highest and lowest value. mode is currently not used. Here, mode determines how we read the grid: To read the entire grid and its header, pass GMT_CONTAINER_AND_DATA. However, if you may need to extract a sub-region you must first read the header by passing GMT_CONTAINER_ONLY, then examine the header structure range attributes, specify a subset via the array wesn, and finally call GMT_Read_Data a second time, now with mode = GMT_DATA_ONLY, passing your wesn array and the grid structure returned from the first call as ptr. In the event your data array should be allocated to hold both the real and imaginary parts of a complex data set you must add either GMT_GRID_IS_COMPLEX_REAL or GMT_GRID_IS_COMPLEX_IMAG to mode so as to allow for the extra memory needed and to stride the complex value-pairs correctly. If your grid is huge and you must read it row-by-row, set mode to GMT_CONTAINER_ONLY | GMT_GRID_ROW_BY_ROW. You can then access the grid row-by-row using GMT_Get_Row. By default, the rows will be automatically processed in sequential order. To completely specify which row to be read, pass GMT_GRID_ROW_BY_ROW_MANUAL instead. Finally, as an option you may add GMT_GRID_XY to the mode and we also allocate the x and y coordinate vectors for the grid or image. If you need to read the same resource more than once you should add the bit flag GMT_IO_RESET to the given mode. input – Contents depends on the value of n_items. If it is zero then we expect a pointer to char holding UNIX wildcard file name(s) to read, otherwise we expect a pointer to an array of character strings (n_items in total) with names of all the files to read. If n_items is NULL then we assume 0 but cannot return the number found. where ptr is NULL except when reading grids in two steps (i.e., first get a grid structures with a header, then read the data arrays). Most of these arguments have been discussed earlier. It is useful when you need to read a series of files (e.g., from a list with filenames) or want to specify the items to read using a UNIX wildcard specification. Note: If used with GMT_DATASET or GMT_TEXTSET then you will receive an array of structures as well. Typically, many data/text files are read into separate tables that all form part of a single SET (this is what GMT_Read_Data does), but if GMT_Read_Group is used on the same arguments then an array of one-table sets will be returned instead. The purpose of your application will dictate which form is more convenient. Here, data is the pointer to your memory object. The function returns the desired filename via filename. This string must be at least GMT_STR16 bytes (16). The other arguments have been discussed earlier. Simply pass this filename in the calling sequence to the module you want to use to indicate which file should be used for reading or writing. The function requires the output filename via filename and then returns the data object, similar to what GMT_Read_Data does. The function requires the virtual file’s filename and then resets the internal counters (e.g., record numbers and other book-keeping parameters). The mode is presently not used. where filename is the name of the virtual file. In the case of data and text tables you have the option of selecting record-by-record reading or writing. As a general rule, your program development simplifies if you can read entire resources into memory with GMT_Read_Data or GMT_Read_VirtualFile. However, if this leads to unacceptable memory usage or if the program logic is particularly simple, you may obtain one data record at the time via GMT_Get_Record and write one at the time with GMT_Put_Record. For row-by-row i/o for grids there is the corresponding function GMT_Get_Row. There are additional overhead involved in setting up record-by-record processing, which is the topic of this section. where family specifies the resource type to be read or written (only GMT_IS_DATASET and GMT_IS_TEXTSET are available for record-by-record handling). The direction is either GMT_IN or GMT_OUT, so for import we obviously use GMT_IN. The function determines the first input source and sets up procedures for skipping to the next input source in a virtual data set. The GMT_Get_Record function will not be able to read any data before GMT_Begin_IO has been called. As you might guess, there is a companion GMT_End_IO function that completes, then disables record-by-record data access. You can use these several times to switch modes between registering data resources, doing the importing/exporting, and disabling further data access, perhaps to do more registration. We will discuss GMT_End_IO once we are done with the data import. The final header argument determines if the common header-block should be written during initialization; choose between GMT_HEADER_ON and GMT_HEADER_OFF. The function returns 1 if there is an error; otherwise it returns 0.
where direction is either GMT_IN or GMT_OUT and geometry sets the geometry that will be produced (or read). where the returned value is either a pointer to a double array with the current row values or to a character string with the current row, depending on mode. In either case these pointers point to ephemeral memory internal to GMT and should be considered read-only. When we reach end-of-file, encounter conversion problems, read header comments, or identify segment headers we instead return a NULL pointer. The nfields integer pointer will return the number of fields returned; pass NULL if your program should ignore this information. Normally (i.e., mode = GMT_READ_DATA), we return a pointer to a double array. To read text records, supply instead mode = GMT_READ_TEXT and we will return a pointer to the text record. However, if you have input records that mixes organized floating-point columns with text items you could pass mode = GMT_READ_MIXED. Then, GMT will attempt to extract the floating-point values from as many columns as needed; you can still access the original record string, as discussed below. Finally, if your application needs to be notified when GMT closes one file and opens the next, add GMT_FILE_BREAK to mode and check for the status code GMT_IO_NEXT_FILE (by default, we treat the concatenation of many input files as a single virtual file). Using GMT_Get_Record requires you to first initialize the source(s) with GMT_Init_IO. For certain records, GMT_Get_Record will return NULL and sets status codes that your program will need to examine to take appropriate response. Table IO-status lists the various status codes you can check for, using the GMT_Status_IO function (see next section). which returns 0 (false) or 1 (true) if the current status is reflected by the specified mode. There are 11 different modes available to programmers; for a list see Table IO-status For an example of how these may be used, see the test program testgmtio.c. Developers who plan to import data on a record-by-record basis may also consult the source code of, say, blockmean or pstext, to see examples of working code. The various modes used to test the status of the record-by-record machinery. where row is a pointer to a pre-allocated single-precision array to receive the current row, G is the grid in question, and row_no is the number of the current row to be read. Note this value is only considered if the row-by-row mode was initialized with GMT_GRID_ROW_BY_ROW_MANUAL. The user must allocate enough space to hold the entire row in memory. and we specify direction = GMT_IN. At the moment, mode is not used. This call will also reallocate any arrays obtained into their proper lengths. The function returns 1 if there is an error (whose code is passed back with API->error), otherwise it returns 0 (GMT_NOERROR). where family must be GMT_IS_GRID or GMT_IS_DATASET, dim is either GMT_IS_X or GMT_IS_Y, and data is the grid or image pointer. This function will be used below in our example on grid manipulation. where the header is the header of an image, and row, col and layer (= 1 for grids) is the position in the grid or image. Note we must use G->header->size (size of allocated array) and not G->header->nm (number of nodes in grid) since the latter is smaller due to the padding and a single loop like the above treats the pad as part of the “inside” grid. Replacing size by nm would be a bug. The API provides two functions for your program to present information to the user during the run of the program. One is used for messages that are always written (optionally with a time stamp) while the other is used for reports whose verbosity level must exceed the verbosity settings specified via -V.
This function takes a verbosity level and a multi-part message (e.g., a format statement and zero or more variables as required by the format string). The verbosity level is an integer in the 0–5 range; these levels are listed in Table timemodes You assign an appropriate verbosity level to your message, and depending on the chosen run-time verbosity level set via -V your message may or may not be reported. Only messages whose stated verbosity level is lower or equal to the -Vlevel will be printed. These messages are typically progress reports, etc., and are sent to standard error. The different levels of verbosity that can be selected. This function always prints its message to the standard output. Use the mode value to control if a time stamp should preface the message, and if selected how the time information should be formatted. See Table timemodes for the various modes. The different types of message modes. There are some differences between calling modules on the command line and using them via the API. These are discussed here. There are two general-purpose modules that are not part of the command-line version of GMT. These are the read and write modules. Both take an option to specify what GMT resource is being read of written: -Tc|d|g|i|p|t, which selects CPT, dataset, grid, image, PostScript, or textset, respectively. In addition both modules accept the infile and outfile argument for source and destination. These may be actual files of memory locations, of course. The GMT module psconvert is normally given one or more PostScript files that may be converted to other formats. When accessed by the API it may also be given the special file name “=”, which means we are to use the internal PostScript string produced by the latest GMT plotting instead of any actual file name. The module can access this string which must be a complete plot (i.e., it must have header, middle, and trailer and thus be a valid PostScript file). This allows the API to convert plots to a suitable image format without any duplication and manipulation of the PostScript itself. Again, family selects which kind of resource is passed via data. The mode determines what kind of comment is being considered, how it should be included, and in what form the comment passed via arg is provided. Table comments lists the available options, which may be combined by adding (bitwise “or”). The GMT_Set_Comment function does not actually output anything but sets the relevant comment and header records in the relevant structure. When a file is written out the information will be output as well (Note: Users can always decide if they wish to turn header output on or off via the common GMT option -h. For record-by-record writing you must enable the header block output when you call GMT_Begin_IO. The modes for setting various comment types. The named modes (command, remark, title, name_x,y,z and colnames are used to distinguish regular text comments from specific fields in the header structures of the data resources, such as GMT_GRID. For the various table resources (e.g., GMT_DATASET) these modifiers result in a specially formatted comments beginning with “Command: ” or “Remark: “, reflecting how this type of information is encoded in the headers. If your program needs to write any of the six recognized data types (CPTs, data tables, text tables, grids, images, or PostScript) you can use the GMT_Write_Data function. Both of these output functions takes a parameter called mode. The mode parameter generally takes on different meanings for the different data types and will be discussed below. However, one bit setting is common to all types: By default, you are only allowed to write a data resource once; the resource is then flagged to have been written and subsequent attempts to write to the same resource will quietly be ignored. In the unlikely event you need to re-write a resource you can override this default behavior by adding GMT_IO_RESET to your mode parameter. To have your program accept results from GMT modules and write them separately requires you to use the GMT_Write_Data function. It is very similar to the GMT_Read_Data function encountered earlier. data – A pointer to any of the six families. Return: 0 on success, otherwise return -1 and set API->error to reflect to cause. where data is a pointer to any of the four structures discussed previously. mode controls if the CPT’s back-, fore-, and NaN-colors should be written (1) or not (0). The entire data set will be written to the single file . Each table in the data set is written to individual files . You can either specify an output file name that must contain one C-style format specifier for a int variable (e.g., “New_Table_%06d.txt”), which will be replaced with the table number (a running number from 0) or you must assign to each table i a unique output file name via the D->table[i]->file[GMT_OUT] variables prior to calling the function. Each segment in the data set is written to an individual file . Same setup as for GMT_WRITE_TABLE except we use sequential segment numbers to build the file names. Each segment in the data set is written to an individual file . You can either specify an output file name that must contain two C-style format specifiers for two int variables (e.g., “New_Table_%06d_Segment_%03d.txt”), which will be replaced with the table and segment numbers, or you must assign to each segment j in each table i a unique output file name via the D->table[i]->segment[j]->file[GMT_OUT] variables prior to calling the function. Writes the dataset in OGR/GMT format in conjunction with the -a setting . The mode is used the same way as for data tables. Here, mode may be GMT_CONTAINER_ONLY to only update a file’s header structure, but normally it is simply GMT_CONTAINER_AND_DATA so the entire grid and its header will be exported (a subset is not allowed during export). However, in the event your data array holds both the real and imaginary parts of a complex data set you must add either GMT_GRID_IS_COMPLEX_REAL or GMT_GRID_IS_COMPLEX_IMAG to mode so as to export the corresponding grid values correctly. Finally, for native binary grids you may skip writing the grid header by adding GMT_GRID_NO_HEADER; this setting is ignored for all other grid formats. If your output grid is huge and you are building it row-by-row, set mode to GMT_CONTAINER_ONLY | GMT_GRID_ROW_BY_ROW. You can then write the grid row-by-row using GMT_Put_Row. By default the rows will be automatically processed in order. To completely specify which row to be written, use GMT_GRID_ROW_BY_ROW_MANUAL instead; this requires a file format that supports direct writes, such as netCDF. Finally, if you are preparing a geographic grid outside of GMT you need to add the mode GMT_GRID_IS_GEO to ensure that the proper metadata will be written to the netCDF header, thus letting the grid be recognized as such. Note: If method is GMT_IS_FILE, family is GMT_IS_GRID, and the filename implies a change from NaN to another value then the grid is modified accordingly. If you continue to use that grid after writing please be aware that the changes you specified were applied to the grid. In the case of data and text tables, you may also consider the GMT_Put_Record function for record-by-record writing. As a general rule, your program organization may simplify if you can write the entire resource with GMT_Write_Data. However, if the program logic is simple or already involves using GMT_Get_Record, it may be better to export one data record at the time via GMT_Put_Record. For grids there is the corresponding GMT_Put_Row function. Similar to the data import procedures, once all output destinations have been registered, we signal the API that we are done with the registration phase and are ready to start the actual data export. As for input, this step is only needed when dealing with record-by-record writing. Again, we enable record-by-record writing by calling GMT_Begin_IO, this time with direction = GMT_OUT. This function enables data export and prepares the registered destinations for the upcoming writing. The n_columns is a number related to the number of output columns you plan to write, while mode controls what that number means. Here, mode = GMT_COL_FIX means it is the actual number of output columns, mode = GMT_COL_ADD means it should be added to the known number of input columns to arrive at the number of final output columns, while mode = GMT_COL_SUB means this value should be subtracted from the number of input columns to find the number of output columns. Normal operation that builds the current output record from the numerical values in rec. For ASCII output mode we write the text string rec. If rec is NULL then we use the current (last imported) text record. If binary output mode we quietly skip writing this record. For ASCII output mode we write the text string rec. If rec is NULL then we write the last read header record (and ensures it starts with #). If binary output mode we quietly skip writing this record. For ASCII output mode we use the text string rec as the segment header. If rec is NULL then we use the current (last read) segment header record. If binary output mode instead we write a record composed of NaNs. The function returns 1 if there was an error associated with the writing (which is passed back with API->error), otherwise it returns 0 (GMT_NOERROR). where row is a pointer to a single-precision array with the current row, G is the grid in question, and row_no is the number of the current row to be written. Note this value is only considered if the row-by-row mode was initialized with GMT_GRID_ROW_BY_ROW_MANUAL. Once the record-by-record output has completed we disable further output to prevent accidental writing from occurring (due to poor program structure, bugs, etc.). We do so by calling GMT_End_IO. This function disables further record-by-record data export; here, we obviously pass direction as GMT_OUT. where data is the address of the pointer to a data container, i.e., not the pointer to the container but the address of that pointer (e.g. &pointer). Note that when each module completes it will automatically free memory created by the API; similarly, when the session is destroyed we also automatically free up memory. Thus, GMT_Destroy_Data is therefore generally only needed when you wish to directly free up memory to avoid running out of it. The function returns 1 if there is an error when trying to free the memory (the error code is passed back with API->error), otherwise it returns 0 (GMT_NOERROR). where data is the address of the array with data containers, i.e., not the array to the containers but the address of that array (e.g. &array), and n is the number of containers. which simply takes the pointer to the GMT API control structure as its only arguments. It terminates the GMT machinery and deallocates all memory used by the GMT API book-keeping. It also unregisters any remaining resources previously registered with the session. The GMT API will only close files that it was responsible for opening in the first place. Finally, the API structure itself is freed so your main program does not need to do so. The function returns 1 if there is an error when trying to free the memory (the error code is passed back with API->error), otherwise it returns 0 (GMT_NOERROR). As you develop a program you may wish to rely on some of the GMT common options. For instance, you may wish to have your program present the -R option to the user, let GMT handle the parsing, and examine the values. You may also wish to encode your own custom options that may require you to parse user text into the corresponding floating point dimensions, constants, coordinates, absolute time, etc. The API provides several functions to simplify these tedious parsing tasks. This section is intended to show how the programmer will obtain information from the user that is necessary to do the task at hand (e.g., special options to provide values and settings for the program). In the following section we will concern ourselves with preparing arguments for calling any of the GMT modules. where options is a comma-separated list of GMT common options (e.g., “R,J,O,X”). You can repeat this function with different sets of options in order to intersperse your own custom options within an overall alphabetical order; see any GMT module for examples of typical layouts. where args is a string of the common GMT options your program is allowed to use. An error will be reported if any of the common GMT options fail to parse, and if so we return 1; if no errors we return 0. All other options, including file names, will be silently ignored. The parsing will update the internal GMT information structure that affects module operations. The wesn array could now be passed to the various read and create functions for GMT resources. Your program can now check that n equals 2 and then use the values in pairs separately. Note: Dimensions given with units of inches, cm, or points are converted to the current default unit set via PROJ_LENGTH_UNIT, while distances given in km, nautical miles, miles, feet, or survey feet are returned in meters. Arc lengths in minutes and seconds are returned in decimal degrees, and date/time values are returned in seconds since the current epoch . where keyword is one such keyword (e.g., PROJ_LENGTH_UNIT) and value must be a character string long enough to hold the answer. In addition to the long list of GMT defaults you can also inquire about the API parameters API_PAD (the current pad setting), API_IMAGE_LAYOUT (the order and structure of image memory storage), API_GRID_LAYOUT (order of grid memory storage), API_VERSION (the API version string), API_CORES (the number of cores seen by the API), API_BINDIR (the API (GMT) executable path), API_SHAREDIR (the API (GMT) shared directory path), API_DATADIR (the API (GMT) data directory path), and API_PLUGINDIR (the API (GMT) plugin path). Depending on what parameter you selected you could further convert it to a numerical value with GMT_Get_Values or just use it in a text comparison. where as before keyword is one such keyword (e.g., PROJ_LENGTH_UNIT) and value must be a character string with the new setting. Note that all settings must be passed as text strings even if many are inherently integers or floats. Return GMT_NOERROR (0) if the module exists, nonzero otherwise. Just print the one-line purpose of the module; args must be NULL. Just prints a list of all modules (including those given as plugins); args must be NULL. Expects args to be a pointer to a doubly-linked list of objects with individual options for the current program. We will see how API functions can help prepare and maintain such lists. Expects args to be a single text string with all needed options. Expects args to be an array of text strings and mode to be a count of how many options are passed (i.e., the argc, argv model used by the GMT programs themselves). When mode > 0 we expect an array args of character strings that each holds a single command line option (e.g., “-R120:30/134:45/8S/3N”) and interpret mode to be the count of how many options are passed. This, of course, is almost exactly how the stand-alone GMT programs are called (and reflects how they themselves are activated internally). We call this the “argc-argv” mode. Depending on how your program obtains the necessary options you may find that this interface offers all you need. If mode = 0 then args will be examined to see if it contains several options within a single command string. If so we will break these into separate options. This is useful if you wish to pass a single string such as “-R120:30/134:45/8S/3N -JM6i mydata.txt -Sc0.2c”. We call this the “command” mode and it is extensively used by the modules themselves. The third, linked-list interface allows developers using higher-level programming languages to pass all command options via a pointer to a NULL-terminated, doubly-linked list of option structures, each containing information about a single option. Here, instead of text arguments we pass the pointer to the linked list of options mentioned above, and mode must be passed as GMT_MODULE_OPT. Using this interface can be more involved since you need to generate the linked list of program options; however, utility functions exist to simplify its use. This interface is intended for programs whose internal workings are better suited to generate such arguments – we call this the “options” mode. The order in the list is not important as GMT will sort it internally according to need. The option structure is defined below. The function returns 1 if there is an error (which is passed back with API->error), otherwise it returns 0 (GMT_NOERROR). to deallocate the space used. This function returns 1 if there is an error (which is passed back with API->error), otherwise it returns 0 (GMT_NOERROR). Several additional utility functions are available for programmers who wish to manipulate program option structures within their own programs. These allow you to create new option structures, append them to the linked list, replace existing options with new values, find a particular option, and remove options from the list. Note: The order in which the options appear in the linked list is of no consequence to GMT. Internally, GMT will sort and process the options in the manner required. Externally, you are free to maintain your own order. Should memory allocation fail the function will print an error message pass an error code via API->error, and return NULL. We return the list back, and if list is given as NULL we return option as the start of the new list. Any errors result in a NULL pointer with API->error holding the error type. An error will be reported if (a) current is NULL or (b) arg is NULL. The function returns 1 if there is an error, otherwise it returns 0 (GMT_NOERROR). We return 1 if the option is not found in the list and set API->error accordingly. Note: Only the first occurrence of the specified option will be deleted. If you need to delete all such options you will need to call this function in a loop until it returns a non-zero status. These options also work on the command line but usually one would have to escape the special characters <, > and ) as they are normally used for file redirection. API developers will need to provide specific code to handle the registration of native structures in their language or application and to translate between the GMT resources and the corresponding native items. Developers should look at an existing and working interface such as the GMT/MATLAB toolbox to see the required steps. where option is the current option and name is the special file name for the memory reference. While the i/o options presented so far lets you easily read in a data table or grid and manipulate them, if you need to do the manipulation in the wavenumber domain then this chapter is for you. Here, we outline how to take the Fourier transform of such data, perform calculations in the wavenumber domain, and take the inverse transform before writing the results. To assist programmers we also distribute fully functioning demonstration programs that takes you through the steps we are about to discuss; these demo programs may be used as your starting point for further development and can be found in the gmt-custom repository. Here, option is the unique character used for this particular program option (most GMT programs have standardized on using ‘N’ but you are free to choose whatever letter you want except existing GMT common options). The dim sets the dimension of the transform; currently you must choose 1 or 2, while string is a one-line message that states what the option does; you should tailor this to your program. If NULL then a generic message is placed instead. which accepts the user’s string option via arg; the other arguments are the same as those above. The function returns an opaque pointer to a structure with the chosen parameters. Here, X is either your dataset or grid pointer, dim is the dimension of the transform (1 or 2 only), mode passes various flags to the setup, such as whether the data is real, imaginary, or complex, and F is the opaque pointer previously returned by GMT_FFT_Parse. Depending on the option string you passed to GMT_FFT_Parse, the data may have a constant level or a trend removed, mirror reflected and extended by various symmetries, padded and tapered to desired transform dimensions, and possibly temporary files are written out before the transform takes place. See the grdfft man page for a full explanation of the options presented by GMT_FFT_Option. which takes as direction either GMT_FFT_FWD or GMT_FFT_INV. The mode is used to specify if we pass a real (GMT_FFT_REAL) or complex (GMT_FFT_COMPLEX) data set, and K is the opaque pointer returned by GMT_FFT_Create. The transform is performed in place and returned via X. When done with your manipulations (below) you can call it again with the inverse direction to recover the corresponding space-domain version of your data. The FFT is fully normalized so that calling forward followed by inverse yields the original data set. The information passed via K determines if a 1-D or 2-D transform takes place; the key work is done via GMT_FFT_1D or GMT_FFT_2D, as explained below. which takes as direction either GMT_FFT_FWD or GMT_FFT_INV. The mode is used to specify if we pass a real (GMT_FFT_REAL) or complex (GMT_FFT_COMPLEX) data set, and data is the 1-D data array of length n that we wish to transform. The transform is performed in place and returned via data. When done with your manipulations (below) you can call it again with the inverse direction to recover the corresponding space-domain version of your data. The 1-D FFT is fully normalized so that calling forward followed by inverse yields the original data set. which takes as direction either GMT_FFT_FWD or GMT_FFT_INV. The mode is used to specify if we pass a real (GMT_FFT_REAL) or complex (GMT_FFT_COMPLEX) data set, and data is the 2-D data array in row-major format, with row length n_columns and column length n_rows. The transform is performed in place and returned via data. When done with your manipulations (below) you can call it again with the inverse direction to recover the corresponding space-domain version of your data. The 2-D FFT is fully normalized so that calling forward followed by inverse yields the original data set. where k is the index into the array or grid, mode specifies which wavenumber we want (it is not used for 1-D transform but for the 2-D transform we can select either the x-wavenumber (0), the y-wavenumber (1), or the radial wavenumber (2)), and finally the opaque vector created by GMT_FFT_Create. which simply frees up the memory allocated by the FFT machinery with GMT_FFT_Create. FORTRAN 90 developers who wish to use the GMT API may use the same API functions as discussed in Chapter 2. As we do not have much (i.e., any) experience with modern Fortran we are not sure to what extent you are able to access the members of the various structures, such as the GMT_GRID structure. Thus, this part will depend on feedback and for the time being is to be considered preliminary and subject to change. We encourage you to take contact should you wish to use the API with your Fortran 90 programs. where dim returns the grid width, height, and registration, limits returns the min and max values for x, y, and z as three consecutive pairs, inc returns the x and y increments, while the title and remark return the values of these strings. The file argument is the name of the file we wish to inquire about. The function returns 0 unless there is an error. Note that you must declare your variables so that limits has at least 6 elements, inc has at least 2, and dim has at least 4.
where array is the 1-D grid data array, dim returns the grid width, height, and registration, limits returns the min and max values for x, y, and z, inc returns the x and y increments, and the title and remark return the values of the corresponding strings. The file argument is the name of the file we wish to read from. The function returns 0 unless there is an error. Note on input, dim can be set to 1, which means we will allocate the array for you; otherwise we assume space has already been secured. Also, if dim is set to 1 we will in-place transpose the array from C-style row-major array order to Fortran column-major array order. where array is the 1-D grid data array, dim specifies the grid width, height, and registration, limits may be used to specify a subset (normally, just pass zeros), inc specifies the x and y increments, while the title and remark supply the values of these strings. The file argument is the name of the file we wish to write to. The function returns 0 unless there is an error. If dim is set to 1 we will in-place transpose the array from Fortran column-major array order to C-style row-major array order before writing. Note this means array will have been transposed when the function returns. Developers may want to access GMT modules from external programming environments, such as MATLAB, Octave, Julia, Python, R, IDL, etc., etc. These all face similar challenges and hence this section will speak in somewhat abstract terms. Specific language addressing the challenges for some of the above-mentioned environments will follow below. 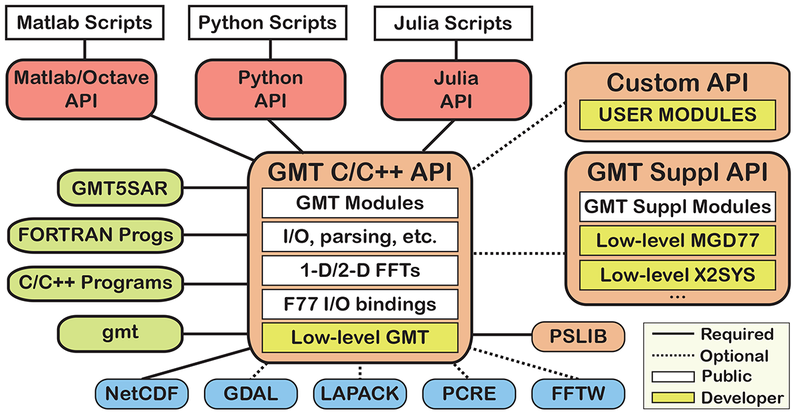 The C/C++ API for GMT makes it possible to call any of the ~100 core modules, the 40 or so supplemental modules, and any number of custom modules provided via shared libraries (e.g., the gsfml modules). Many of the external interfaces come equipped with methods to call C functions directly. The key challenges pertain to specifying the input to use in the module and to receive what is produced by the module. As we know from GMT command line usage, all GMT modules expect input to be given via input files (or stdin, except for sources like grids and images). Similarly, output will be written to a specified output file (or stdout if the data type supports it). Clearly, external interfaces could do the same thing. The problem is that most of the time we already will have the input data in memory and would prefer the output to be returned back to memory, thus avoiding using temporary files. Here, we will outline the general approach for using the GMT API. We will describe a relatively low-level approach to calling GMT modules. Once such an interface exists it is simpler to build a more flexible and user-friendly layer on top that can handle argument parsing in a form that makes the interface seem more of a natural extension of your external environment than a forced fit to GMT’s command-line heritage. Before we describe the interface it is important to understand that the GMT modules, since the beginning or time, have done the i/o inside the modules. While these steps are helped by i/o library functions, the i/o activities all take place inside the modules. This means that external environments in which the desired input data already reside in memory and the desired results should be returned back to memory pose a trickier challenge. We will see the solution to this involves the concept of virtual files. GMT Modules can read and write information in may ways. The GMT command line modules can only access the methods in white, while all methods are available via the C API. External interfaces will preferentially want the methods in orange. where results (i.e., objects returned back to memory) is optional and may be one or more items grouped together, depending on language syntax. If no output is required then no left-hand side assignment will be present. Likewise, inputs is optional and may be one or more comma-separated objects present in memory. In most cases, options will be required and this is a string with options very similar to the arguments given on the GMT command line. Finally, module is required since you must specify which one you want to call. The coding of the gmt method, class, or function above may be written entirely in C, partly in C and the external scripting language, or entirely in the scripting language, depending on restrictions on what needs to be done and where this is most easily accomplished. How this is accomplished may vary from environment to environment. Data pass in and out of the gmt interface which may be written in the scripting language used by the external interface. The native data will need to be encapsulated by GMT containers and this step may be done by a C parser but could also be done by the gmt interface directly. Either of these communicate directly with the C functions in the GMT API. The external interface developer will need to create native data classes or structures that are capable of containing the information associated with the 6 GMT objects: data tables, grids, images, color palette tables, PostScript documents, and text tables. In other words, how your external environment will represent these data in memory. Some of these “containers” may already exist, while others may need to be designed. Most likely, you will end up with a set of six containers that can hold the various GMT data objects and related metadata. In addition, it may be convenient to also consider the two GMT helper objects MATRIX and VECTOR, which may be closer to the native representation of your data than, for instance, the native GMT_DATASET. Create a GMT C container marked for input and copy or reference your data provided by your external environment into this container. Open a virtual file using this container to represent the input source. Insert this virtual file name in the appropriate location in the GMT option string. If the module imports data from stdin then we can use the hidden option -<filename. When the GMT module is run it will know how to make the connections between the virtual file names and the actual data via information stored inside the C API. When the module completes you should close any open virtual files that were used by the module. Create an empty GMT C container of the right type marked for output. Create a virtual file name to represent this output destination. Place this file name in the appropriate location in the GMT option string. If the module exports data to stdout then we can use the hidden option ->filename. When the GMT module is run it will know how to make the connections between the memory allocated by the module and the virtual file names stored inside the C API. Once the module call has completed you can access the results in the external environment by using GMT_Read_VirtualFile with the virtual filename you created earlier. This will return a GMT C container with the results, and you can now populate you external data containers with data produced by the GMT module. External developers have access to the two extra API functions GMT_Encode_Options and GMT_Expand_Option. Your gmt will need to call GMT_Encode_Options to obtain information about what the selected module expects, what its options are, which were selected, and what data types are expected. It may possibly modify the options, such as adding the filename “?” to options that set required input and output files and returns an array of structures with specific information about all inputs and outputs. If sources and destinations were missing from your options string it is taken to mean that you want to associate these sources and destinations with memory locations rather than actual files. The second function GMT_Expand_Option can then then used to replace these place-holder names with the virtual filenames you created earlier. We have built a MATLAB/Octave interface to GMT called the toolbox. It was our first attempt to use the C API from an external environment and its development influenced how we designed the final GMT C API. MATLAB represents most data as matrices but there are also structures that can hold many different items, including several matrices and text strings. Thus, we designed several native mex structures that represent the six GMT objects. The main gmt function available in MATLAB derives from a small MATLAB script (gmt.m) which handles basic argument testing and then passes the arguments to our C function gmtmex.c. Most of the high-level parsing of options and arguments is done in this function, but we also rely on a C library (gmtmex_parser.c) that hides the details of the implementation. It is this library that does most of the work in translating between the GMT and MATLAB object layouts. Knowing what types are represented by the different sources and destinations is provided by the array of structures returned by GMT_Encode_Options. Unlike the MATLAB interface, the Julia interface is written entirely in the Julia language. We earlier introduced the six standard GMT resources (dataset, grid, image, color palette table, PostScript, textset) as well as the user vector and matrix. Here are the complete definitions of these structures, including all variables accessible via the structures. Each data set is represented by a GMT_DATASET that consists of one or more data tables represented by a GMT_DATATABLE, and each table consists of one or more segments represented by a GMT_DATASEGMENT, and each segment contains one or more rows of a fixed number of columns. If the dataset originated from an OGR/GMT file then there will be items such as an GMT_OGR structure per table and a GMT_OGR_SEG structure per segment. 2: use segment->file[GMT_OUT] to write separate segments. A grid is represented by a GMT_GRID that consists of a header structure represented by a GMT_GRID_HEADER and an float array data that contains the grid values. /* == The types of the following 12 elements must not be changed. An image is similar to a grid except it may have more than one layer (i.e., band). It is represented by a GMT_IMAGE structure that consists of the GMT_GRID_HEADER structure and an char array data that contains the image values. The type of the array is determined by the value of type. A CPT is represented by a GMT_PALETTE structure that contains several items, such as a GMT_LUT structure data that contains the color information per interval. The background, foreground and Nan-color values have colors specified by the GMT_BFN array structure bfn. As each actual color may be specified in different ways, including as an image, each color slice is represented by the GMT_FILL structure. The full definition of the GMT_LUT structure. Bulk PostScript is represented by a GMT_POSTSCRIPT structure that contains data that points to the text array containing n_bytes characters of raw PostScript code. The mode parameter reflects the status of the PostScript document. Each text set is represented by a GMT_TEXTSET that consists of one or more text tables represented by a GMT_TEXTTABLE, and each table consists of one or more segments represented by a GMT_TEXTSEGMENT, and each segment contains one or more rows of strings. 2 means use segment->file[GMT_OUT] to write separate segments. User matrices are represented by a GMT_MATRIX structure that contains data that points to an array of size n_columns by n_rows. The type indicates the memory type of the matrix, which is represented by the GMT_UNIVECTOR union. User vectors are represented by a GMT_VECTOR structure that contains data that points to an array of n_columns individual vectors. The type array indicates the memory type of each vector. Each vector is represented by the GMT_UNIVECTOR union which can accommodate any data type. To increase readability we have encoded many simple integer constants as named enum. These are listed in the tables below and used as flags to various API functions. The known data types in the GMT API. or via a very confusing and ever-changing myriad of low-level library functions for bold programmers. Currently, C/C++, FORTRAN, MATLAB and Julia are being tested. At the moment, GMT does not have native support for 3-D grids. This may change in later releases. However, there is no thread-support yet, so you will need to manage your own threads.